The one thing that challenges nearly all our clients is the struggle to find new clients. This 3000+ word guide will help you use LinkedIn to find new clients, connect with your audience, and ultimately grow your web design business. If you are like most people you use LinkedIn as your online resume. You uploaded your details once, maybe a few years ago. And forgot all about it. Are you a freelance web designer? Then your main customer acquisition method is most likely having a profile on one or several of the freelancer platforms and/or partnerships with agencies and other web developers. Are you a marketing agency offering web development? Then you probably spend a lot of money on AdWords to appear first in Google search results. In both cases there are many competitors fighting for the same projects. How about getting projects which are not even on the market yet? One channel to consider is LinkedIn. Nowadays it is so much more than a platform for recruiters. So yes, you should be on it even if you are not looking for a job. It’s like a business-only Facebook. 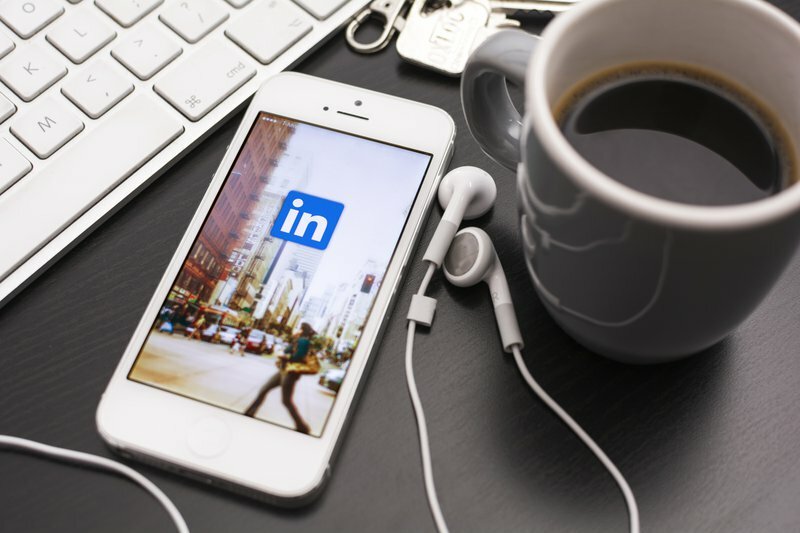 LinkedIn is so much more than a platform for recruiters. I often hear: “social media is not for me”. These are the most common objections people have: I don’t need it, I don’t have time for it, I don’t know how it works, it’s easier/quicker to advertise. If you don’t need it: You are swamped with work as it is. Congrats. If you don’t want to grow your business, carry on as you were. But if you do want to grow it, LinkedIn can help you get better projects and find people to work with you. If you don’t have time for it: Do you have time to sell? Then get active on LinkedIn and you can sell more in less time, with less effort, and completely for free. I don’t know how it works: This is two-fold: mechanical and emotional. On one hand you don’t know how the platform works: what to include in your profile, and what type of content is engaging. On the other hand you might be afraid of sharing too much, of making mistakes. In this post I’ll introduce you to how you can optimise your profile and be active on LinkedIn. I’ll also share tips on how you can test content in a safe way. It’s easier/quicker to advertise:Doing your marketing online is getting more and more costly, and it’s difficult to get any attention. We are craving personal connections - and that is where LinkedIn comes in. In my research for this article, I found that barely any web designers nor digital marketing agency owners are actively using LinkedIn. They seem more active on Twitter and Instagram - but is that where your customers are spending their time? It’s always great to lead the way - here is your chance to be seen as the expert or go-to person! Many marketers and business owners are active on LinkedIn. These are people who are likely to need a website for their companies. Engage with them and land new projects. How Can I get Leads via LinkedIn? In this article, you'll learn actionable ways to have a better profile, more connections and more engagement. 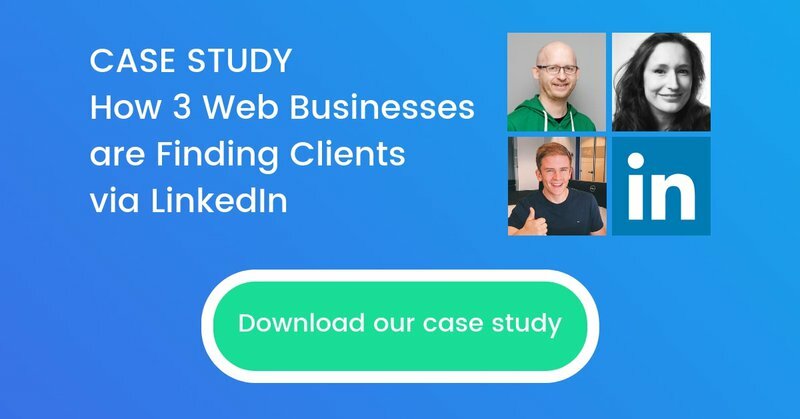 If you want more practical insights, you should also download the case study on three web professionals that are already using LinkedIn to find new clients. I walk the talk. Instead of reading advice on what content works on LinkedIn or how to optimise my profile, I test it. I’m a marketing freelancer and event producer and share what I learn from experience, not something I read. I am not a web designer, but I’ve shared these tips with people active in the field to confirm these insights are applicable to web design business too. I use LinkedIn every day to find clients, feedback, recommendations, collaboration opportunities, and of course to learn. I've sold event tickets, I get collaboration requests for projects, and I get contacted to do interviews for positions without even looking for a job, all solely thanks to being active on LinkedIn. In this post I will share my methods and tactics so that you can get there too with the least amount of effort and time! 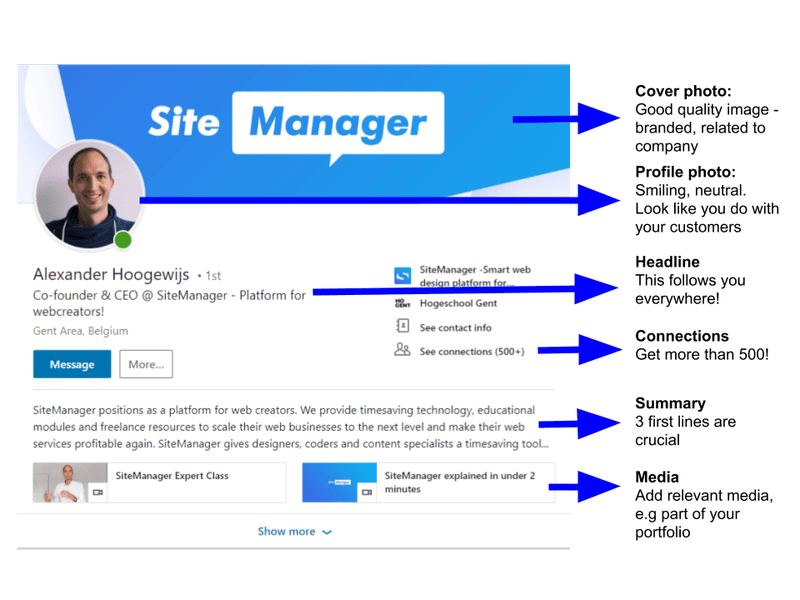 As an example, I use SiteManager CEO Alexander Hoogewijs’ LinkedIn profile. This is a great place to feature your logo or your client portfolio. Make sure it looks good on the mobile version too where the profile photo is in the middle instead of to the left-hand side. What should you wear for a profile picture? I got a great tip from a photographer friend of mine who takes headshots for profile pics. “Dress and look like you are meeting a very important client”. If you want to play with the background and options I recommend you browse through event speaker images online, for example the Beyond Tellerrand event here. Do smile - this makes you more approachable! Everytime you comment, like or do something on LinkedIn your name and headline is exposed. Make sure it’s clear what you (and your company) does. This is also important when people are searching for you. If I’d be looking for someone to make my website I’d probably look for “Freelance Web Designer”. If that is who you are, make sure it shows in the title. But be careful - this can also lead to more spam if recruiters and sales agents can find you more easily. Tip: Sometimes people add emojis to their names to be more visible and memorable. LinkedIn shows the exact numbers of connections up to 500. After that it’s 500+. I see this as a sign of someone active (500+) vs. not active (<500) on LinkedIn. Make your reader click “Show more”. For inspiration check out this guide. Contain enough information for your potential connection to say “Yes, I want to connect with that person”. Here Alexander focuses on SiteManager’s value proposition on keeping deadlines, and saving time and effort. You should too. Your summary should showcase what you do, why, what is special about you, how you do your job and what people should contact you for. You can add or link to external documents, photos, websites, videos and presentations. Use this opportunity to showcase your achievements. Add a link to your web design business' portfolio or even upload a video. Your latest article will be shown prominently on the first page of your profile. I recommend you use this space to show your expertise and provide valuable content for your potential clients. You can for example copy the content of one of your well-performing blog posts. As you would in your CV, the Experience section is where you would list your current responsibilities and achievements. You can also do the same as Alexander and showcase what your company does. Do make a company page to have the logo featured instead of the grey brick. This means you need to have a LinkedIn company page connected with your profile. You can sort your skills, making sure the most relevant ones are in the top 3. This is important for searches. The easiest way to get endorsements is to give them. The more recommendations, the better. You can ask for a recommendation e.g. by providing a list of questions you’d like to have answered. Here are some sample questions: What is the thing that stands out when working with me? What are my strong points? How do you perceive me as a professional? Once you've optimized your profile it's time to unleash the real power of LinkedIn: engaging and connecting with your audience. I will host a free 30 min webinar, explaining you how to use LinkedIn to find new clients. I will speak from my personal experiences as a freelancer.